SABERS GIRLS: 2019 AISA CHAMPIONS! Boys recap: A relatively young Sabers boys soccer team placed a respectable 3rd at the 2019 AISA soccer tournament held in Yokohama. After going scoreless on day 1, the Sabers boys soccer team found themselves in a tie for 2nd place in their pool and facing a tiebreaking "kicks from the penalty mark" shootout with KIS early Saturday morning. For a young team, this might have been a nerve-wracking experience, but the Sabers were calm, not even bothering to put on their uniforms, and won the shootout to advance to the semifinals, where they lost to eventual champions Yokohama International School. All-tournament team members were Neo Yokoyama, Kentaro Okuda, and Taishi Fukuda. A big thank you to Coach Entwistle and Coach Nikolic. Girls recap: The Sabers girls soccer team went undefeated through pool play and the semifinals, but they gave up a goal in each match. The defense tightened up in the finals, holding the host Korea International School Phoenix to a scoreless draw. The Sabers prevailed in an exciting "kicks from the penalty mark" shootout, 3-1, to repeat as AISA champions. All tournament team members were Leona Yanagi, Keito Iuchi, Ririko Okuno, and Nanami Hasegawa. Special congratulations to Coach Kono who single-handedly coached the team this year. Thank you to chaperone Matsuda-sensei. The Sabers girls and boys soccer teams play in Association of International Schools in Asia (AISA) championship tournaments this weekend, April 11 and 12, 2019. The boys, led by Coach Entwistle and Coach Nikolic, travel to the Yokohama Athletic and Country Club (YCAC) in Yokoyama, for the tournament hosted by Yokohama International School. Here is the tournament website. 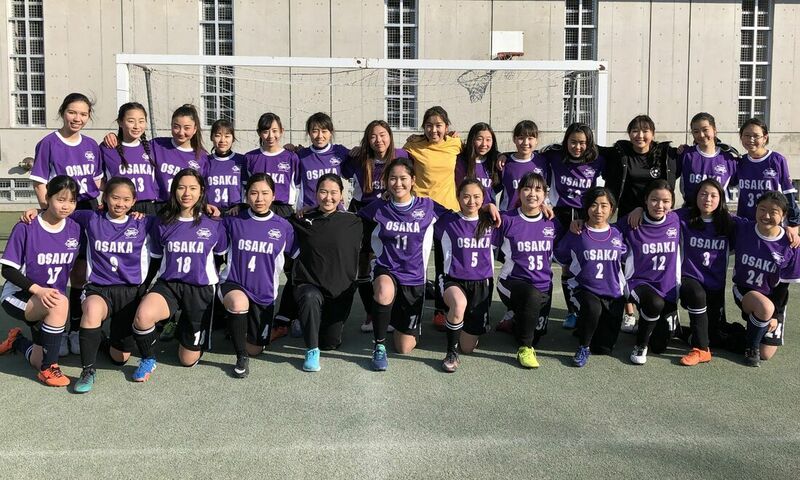 The girls, coached by Coach Kono and chaperoned by Matsuda-sensei, travel overseas, playing at Korea International School in Seoul, South Korea. Here is the tournament program and a link to the livestream. The Sabers girls and boys soccer teams play in Western Japan Athletic Association (WJAA) championship tournaments this weekend, March 8 and 9, 2019. The girls, coached by Coach Kono and chaperoned by Yukawa-sensei, travel to the Yokohama Athletic and Country Club (YCAC) in Yokoyama, for the tournament hosted by Yokohama International School. Here is the tournament website. The boys, led by Coach Entwistle and Coach Nikolic, stay closer to home, playing at Canadian Academy on Rokko Island in Kobe. Here is the tournament webpage and match schedule. math team: top 5 finish behind perennial powerhouses KIS and SIS; OIS grade 11 Riki Sampson was the top Sabers "mathlete". basketball, boys: 4th place after a challenging weekend. Four Sabers teams took part in AISA events, January 24-27, 2019, in Seoul, Yokohama, and Osaka. Math mania: Led by Mr. Bertman, 6 SOIS "mathletes" competed in a math mania event hosted by Seoul International School (SIS) in South Korea. Leadership: Led by Mr. Sheriff, 4 SOIS student council leaders participated in a leadership conference, also hosted by SIS in Seoul. 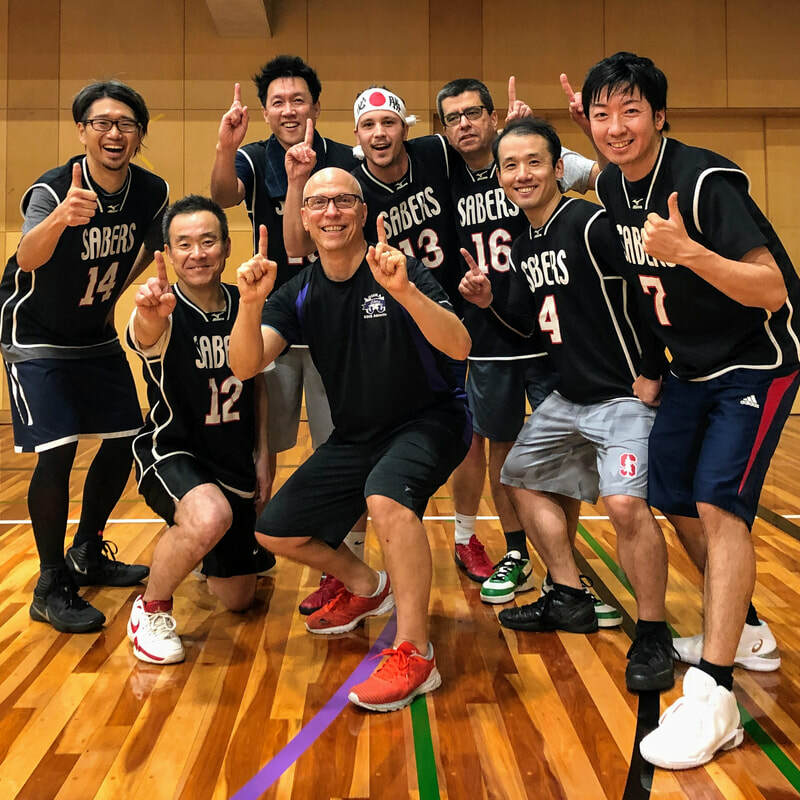 Basketball, boys: The Sabers high school boys varsity basketball team, coached by Morioka-sensei and Mr. Kralovec, vied for a season-ending championship at the annual AISA tournament, hosted this year by Yokohama International School. Basketball, girls: After hosting - and winning - the WJAA girls basketball tournament last week, SOIS hosted the AISA tournament this week. The Sabers, coached by Sagara-sensei and Okamoto-sensei, were defending AISA champions, having won the tournament last year in Busan. The Sabers JV team competed, also. ​Both the boys and girls basketball tournaments will be livestreamed. Be sure to tune in. Click on the basketball links above for tournament information. SOIS hosted the 2019 Western Japan Athletic Association (WJAA) high school girls varsity basketball championship tournament January 18-19 in a chilly Sabers gym, and the Sabers thrilled the home crowd by winning the WJAA title, defeating Yokohama International School in the finals, 35-32. In a scrappy defensive battle full of turnovers and jump balls, neither team could mount much of an offensive attack. OIS senior Niki Heimer led the Sabers with 10 points, with SIS senior Yulia Ikumi adding 9 points despite spending much of the game on the bench with foul trouble. Haruka Mibuchi scored 8 points, Akari Sugimoto added 4, and Sakura Okamoto and Karen Akashi each chipped in 2 points to round out the scoring for Coach Sagara's team. Yulia Ikumi, Haruka Mibuchi, and Sakura Okamoto were named to the all-tournament team. For more details (rosters, photos, scores), visit the tournament webpage. For Makoto Honda, 1998 graduate of SIS (then known as OIA, Osaka Intercultural Academy) and veteran of many basketball victories on the Sabers hardwood, Wednesday night’s annual Fossils-Sabers matchup was especially important. Fossils victorious over Sabers varsity team, 55-54.
by 2 with 4.3 seconds left. Uenoya was euphoric after the win. “Yeah, it was a great feeling, that’s for sure. I’ve been working on my game every week in the semi-pro WNL (Wednesday Night League) and I guess it all finally paid off,” said Uenoya. In addition to Uenoya’s stellar performance, former Sabers player and current SIS math teacher, Ryuhei Okamoto, poured in 12 points, and new SOIS PE teacher and basketball novice, Djordje Nikolic, contributed 9 points. OIS head of school Bill Kralovec added 6 points in his Fossils farewell. Parent Mike Yamamoto scored 2 points and pulled down 6 rebounds. ​Other Fossils players were SIS English teacher Rodney Ray, OIS principal Kurt Mecklem, and new SIS science teacher and basketball coach Akira Morioka. The embarrassing loss left the varsity players in a state of disbelief, wondering what could have been, what should have been. But on this particular night, Makoto Honda got a chance recapture some past glory of the SOIS gym, reminding us all that: Once a Saber, always a Saber. 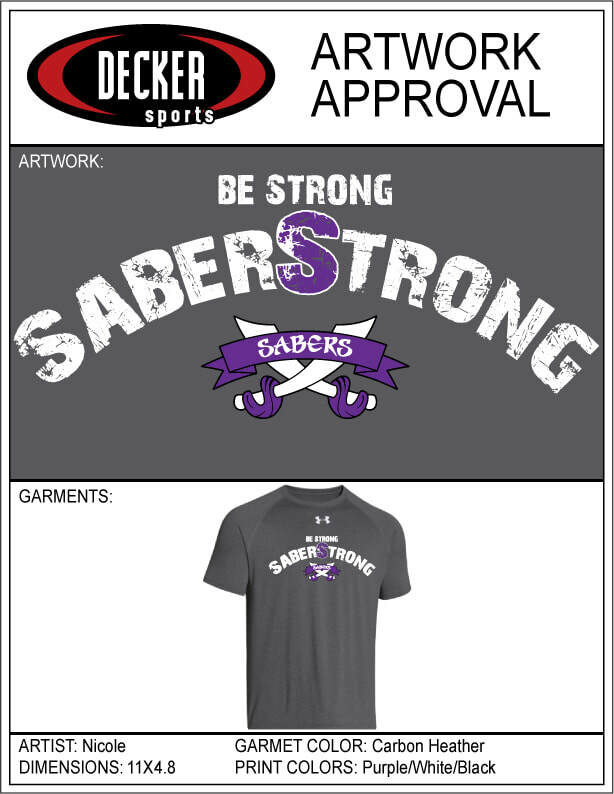 Sabers athletic gear is now available for sale. Deadlines approaching. Sabers jacket ジャージ. Order deadline 締切: 2018年10月22日(月)18:00まで. Pink order sheet. Sabers hoodie パーカー. Order deadline 締切: 2018年10月26日(金)18:00まで. Online order form. 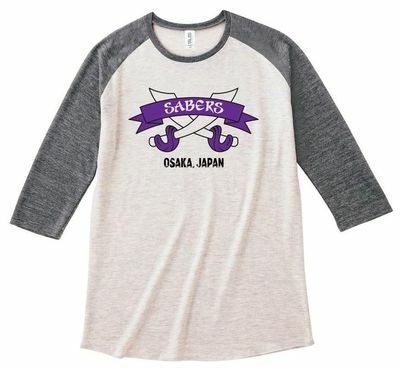 Sabers t-shirts. 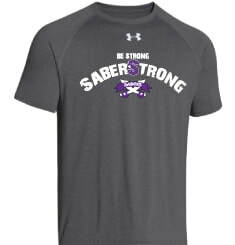 "SaberStrong" short-sleeve Under Armour, and Sabers logo long-sleeve raglan. AD office. Visit the Sabers merchandise page for details. Show your Sabers spirit! Go Sabers! Three high school Sabers teams - cross country, girls volleyball, boys volleyball - wrapped up their 2018 fall campaigns with strong showings at AISA competitions Friday and Saturday, October 12-13, 2018. Top billing goes to Coach Hirai, Coach Yoneda, and the girls volleyball team who dominated the 2018 AISA tournament held at Seoul International School, conceding only one set in four matches, and dismantling the Dragons of Yokohama International School in the finals, three sets to none. All-tournament team members are Yulia Ikumi, Asumi Muto, and new SIS 11th grader Miharu Otake whose thunderous spikes were like many sale items from Amazon - nonreturnable, no matter how hard you try. Otake, who spent the past four years in the US, credits her jumping ability and power to the strength training she did there. Otake says, "Strength, speed, and jump training has really benefited my explosiveness, flexibility, and coordination. And I think it has helped prevent injuries, for me, anyways. I hope more Sabers athletes, boys and girls, will learn how to do athletic multi-joint compound exercises like cleans and squats. It made a big difference for me. An AISA championship made all the hard work worth it." Coach Mitsuhashi, Coach Majima, and the boys volleyball team traveled to International School Busan with high hopes of repeating their 2017 AISA championship, but fell short of that, losing to Yokohama International School in the consolation match to finish in 4th place. Richie Dix and Neo Yokoyama were named to the all-tournament team. 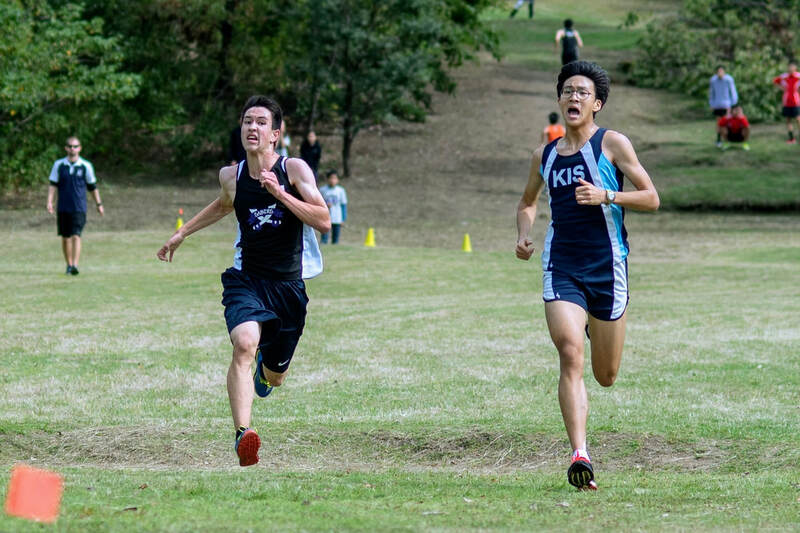 With only one senior – Fumiya Okabe – and two freshmen, the Sabers are already looking forward to a better finish next year. 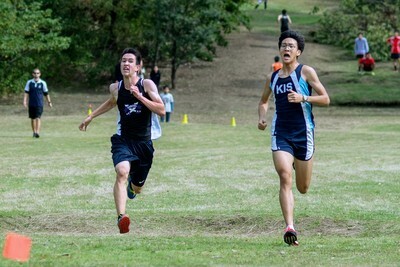 SOIS hosted the second annual AISA cross country meet at Senri Kita Koen. The meet featured freshly mowed grass (thank goodness), perfect weather (thank goodness), and a thrilling finish in the opening race (oh my goodness!). 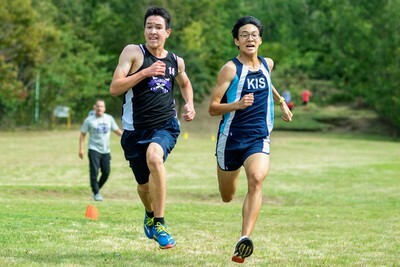 In the first race of the meet, the men’s 1st and 2nd seed individual race, OIS junior Riki Sampson came from behind in the final 50 meets to edge a surprised KIS runner at the line by 0.13 seconds. (See photos below.) A tired but elated Sampson told reporters, “I miscounted and thought there was one more lap, so I was saving my energy. Fortunately, I realized my error just in time. I was always better at sprinting than at math.” Sampson's AISA victory was the big highlight for an SOIS team that finished in 3rd place out of four teams, a long 89 points behind champions KIS. The Sabers had only four boys on the team, so their scores were “pushed” too high to make any run at a better finish. All-meet members were Miki Fujito, Karin Iwaki, Tyus Sheriff, and Riki Sampson. The Sabers won the “fair play” award, a great testament to the spirit and camaraderie of the team. Coach Munemasa and Coach Cheney look forward to building up team numbers and team speed in the upcoming years. 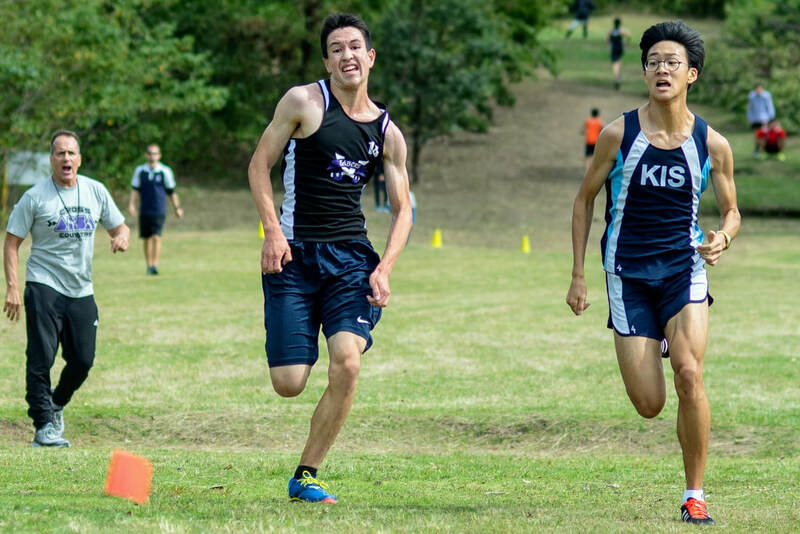 Be sure to check out the cross country webpage for more details and photos. Congratulations to all Sabers 2018 fall season high school teams, managers, and coaches. 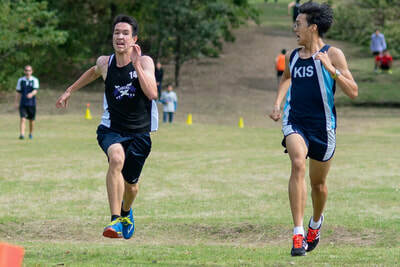 Below: Sabers 1st seed runner Riki Sampson (left, black uniform) chases down a started KIS Phoenix runner and crosses the finish line just 0.13 seconds ahead to capture the 2018 AISA men’s individual championship.